Though Bauhaus objects, art, and buildings vary stylistically, the school’s defining teaching principle was the combination of technical craftsmanship and artistry, with an emphasis on mass production so that art of the everyday could be functional and accessible to all. The school also influenced other Modern architecture movements, such as Midcentury Modern and International Style. Many renowned artists, architects, and designers passed through the halls of the school during its short tenure, from 1919 until 1933, when the Nazi regime forced the Bauhaus school to close. After the school closed, Bauhaus alums and teachers—many of whom were Jewish or leftists fearing persecution from the Nazis—fled the country. Thus, Bauhaus lived on to become one of the most influential art movements in the 20th century. Several individuals associated with Bauhaus chose to make America their new home, and this guide traces their footprints through the buildings they designed, the places where they taught and lived, and the people they influenced. Explore their legacy at any of the places below. 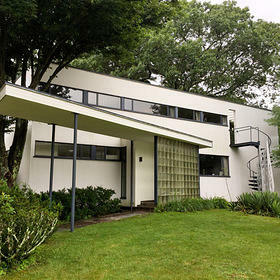 Constructed by Walter Gropius, founder of Weimar’s Bauhaus school, this unique property lives on today as a National Historic Landmark. The home combined New England materials like wood, brick, and fieldstone, with those signature to the Bauhaus school style, such as glass block, acoustical plaster, chrome banisters, and high-tech fixtures). The home also features furniture designed by Gropius’ contemporary, Marcel Breuer. 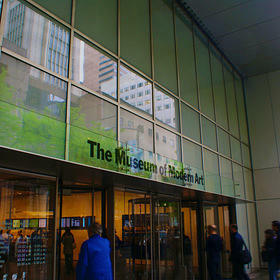 The Museum of Modern Art (MoMA) displayed its first exhibit of Bauhaus design in 1938. The survey displayed almost 700 examples of textile, glass, wood, canvas, metal, and paper works that came from the school. Five years before the exhibit debuted, the Nazi Party had forced the Weimar Bauhaus school to close. Today, MoMA features many students and teachers from the Bauhaus school, including Marianne Brandt, Lyonel Feininger, Paul Klee, Vasily Kandinsky, Herbert Bayer, Marcel Breuer, Anni Albers, and Oskar Schlemmer, in its collections. Though it’s not quite as famous as MoMA, the Whitney Museum of American Art once served as an ode to Bauhaus architecture. 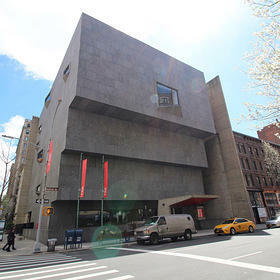 The museum was designed by Hungarian-born Bauhaus student Marcel Breuer in an inverted ziggurat (rectangular stepped tower based on structures from ancient Mesopotamia), constructed with granite and concrete on Madison Avenue. The Whitney Museum has since moved downtown, but this Brutalist building is still open as part of the Metropolitan Museum of Art, now called the Met Breuer. The final director of the Bauhaus school before it closed in 1933, Mies van der Rohe designed the master plan for the Illinois Institute of Technology campus. But S.R. Crown Hall, constructed in 1956, most effectively captures the essence of Midcentury Modernism with its open-concept main floor and large glass windows that allow natural light to fill the hall. Farnsworth House, designed by Mies van der Rohe in 1945 and constructed in 1951, is National Trust Historic Site and an exemplary representation of International Style architecture. Lilly Reich, a fellow Bauhaus artisan and Mies’ former romantic partner, collaborated with the architect on several of his famous furniture designs. 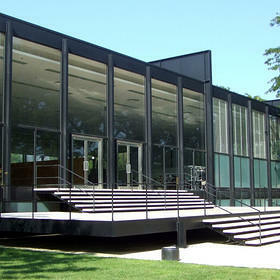 The pieces Mies used to furnish Farnsworth House were likely inspired by Reich’s work. 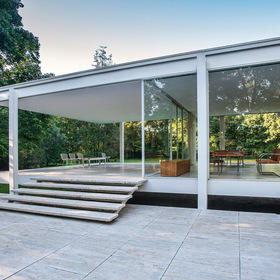 Architect and one-time curator at MoMA, Philip Johnson took inspiration from Mies van der Rohe’s Farnsworth House and created the Modernist Glass House in Connecticut. The entirely glass, rectangular home contains no interior walls, a radical departure from other houses at the time. The property, a National Trust Historic Site, also features a permanent collection of renowned 20th-century paintings and sculpture. 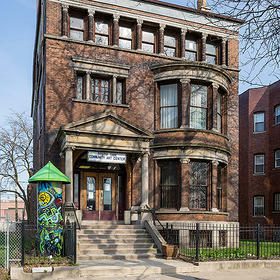 Hin Bredendieck and Nathan Lerner, two prominent figures in the New Bauhaus school in Chicago (which opened after the original Bauhaus school closed), transformed this Classical Revival home on the city’s South Side into a modern art gallery commissioned by President Franklin D. Roosevelt’s Works Progress Administration program during the Great Depression. The art center went on to feature works by both unknown and renowned African American artists. Today, it’s a National Treasure of the National Trust. Anni Albers, a student of the Bauhaus School who revolutionized the practice of 21st-century weaving, was forced to leave Germany with her husband Josef Albers after the rise of Nazism. The pair traveled to Black Mountain College in North Carolina, becoming the university’s first art teachers. The school was unique for its time, as it was owned and operated by its faculty, as well as committed to both democratic governance and the inclusion of the arts in its curriculum for all students. 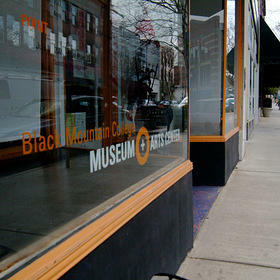 Today, Black Mountain College Museum and Arts Center commemorates the history of the former college. A master of printing and advertising at the Bauhaus school, Herbert Bayer became enchanted with Aspen, Colorado, when he visited in 1945. 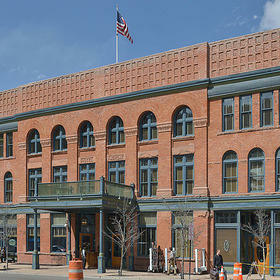 The artist quickly got a job as a design consultant and moved downtown, designing structures and landscapes at the Aspen Institute; restoring several buildings in the area, including Wheeler Opera House and Hotel Jerome; and creating a print advertising campaign that helped revitalize Aspen as a 20th-century tourism hub. 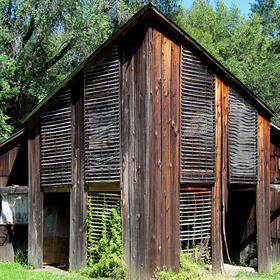 The site of Pond Farm workshops, an artist colony conceived during World War II by couple Gordon and Jane Herr, is a National Treasure of the National Trust that includes two small residences and a barn. But its history is far more interesting. Most notably, famed ceramicist and Bauhaus artisan Marguerite Wildenhain lived at the colony until her death in 1985, teaching at the property’s nationally renowned summer school for three decades.